It's a minefield of spoilers out there. As a PC player who owns a PlayStation 4, the release of Red Dead Redemption 2 puts me in a very light bind. PC is my format of choice for GTA Online, and everyone I play multiplayer games with lives on Steam—but next month, when Red Dead Online arrives on PS4, I'm too intrigued about the multiplayer mode to wait for a possible port. Everyone I know will be playing it then. If Red Dead 2 does eventually come to PC, though, and if it's anything like GTA 5, it'll probably be the best-looking version by miles. It's a slightly annoying but familiar trade-off: play it now, or wait for the game at its best. Console ports arriving later on PC is not a new thing, and Rockstar almost always takes its time to bring a PC edition across. Going as far back as GTA 3, that arrived about seven months after the PS2 version in 2002. GTA 5, of course, arrived well over a year after the original console release. A couple of things make me think differently about the gaps between console and PC releases in 2018: how games are immediately discussed, dissected and shared, and how quickly big games are changing with substantial updates. People are now so accustomed to sharing what they experience in games. Yesterday, I saw a thumbnail for a video about Easter Eggs that have already been discovered in Red Dead's world less than a week after release. I get why there's a demand to see that stuff as early as possible, but if you want to wait for the PC version, avoiding all that for months can actually be a pain in the arse. On Twitter, I'm wary of 'frequent sharers'—people who think I need to see their Spider-Man selfies in this year's PS4 game, or that it's important to ruin every snapshot of the pyramids in Assassin's Creed Origins before I've even had time to play the damn thing. It's cool that we can use social media platforms to share positive experiences, amazing sights or funny moments from games, but it also means you basically have to switch the internet off if you want to preserve the element of surprise. To me, it feels harder to avoid the chatter around big games now than it used to be. It's never been easier to have a game spoiled for you—and I don't just mean in the story sense. This weekend I've seen about a dozen videos pop up on Twitter with tedious captions like "I'm howling", where I see just the thumbnail of Red Dead's Arthur Morgan about to smash his horse into another horse, or whatever. And I don't want to see any of it (at this point I feel it's important to point out that I don't hate fun, I promise). Personally, I would consider a snapshot of a place I haven't seen in Red Dead Redemption 2 a spoiler. Your mileage on spoilers might vary, but if you're waiting for a PC version, it's going to be a goddamned minefield until Rockstar releases one—assuming it does. I probably wouldn't eat this sweaty-looking meat in real life. Final Fantasy 15 is another one that I felt like had been dissected and shared to death before it came to PC. It was still exciting to have the game on PC at all, of course, and it's beautiful to look at on high settings. A couple of systems in Final Fantasy 15 are very cleverly designed to be shareable, though, which made the game extra pervasive at launch: the lovely food made by Ignis, your party's chef, and the in-game photos taken by Prompto, your party's photography enthusiast. Then there's games with 'live' elements, which are increasingly important in what we play. Monster Hunter: World's many updates are now rolling out on a delayed schedule on PC, which allows players to enjoy them in the order PS4 and Xbox owners did. The thing you don't get, though, is the same element of surprise and expectation that they had. This is definitely a minor gripe—people get to play the same great game, after all—but it's nonetheless part of how console players experienced Monster Hunter by having it earlier. Publishers don't owe PC players simultaneous releases, and getting the game ready just for consoles is no doubt tons of work. From a player perspective, though, it does make a huge difference when everyone is playing the game at the same time—no one is left out of the conversation. In Red Dead Redemption 2's case, I can't help but think about how much GTA Online changed over the course of its lifespan. We actually got it at a great time on PC, just as the heists launched. 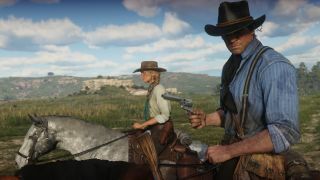 With Red Dead, I can't help feeling like Rockstar will be better prepared for online from the start this time. For years now, GTA has supplied weekly updates that include new vehicles, modes, skins and bonuses. I can't be sure Red Dead will be exactly the same deal—a gold-plated horse would be a hard sell—but I expect it to evolve on a similarly regular basis after it launches next month. Taking that journey on PC from day one would've been nice. Back to that familiar sentiment, then: if Red Dead Redemption 2 comes to PC someday, it'll at least be the best-looking version by miles.